All About Development provides the early intervention services to support and promote your child's development. Our professional team of therapists and educators partners with parents to design and implement customized programs that meet each child's special needs. The earlier the intervention, the greater the long-term effect on the child. Early intervention services are provided at no cost to the family. We work with you to determine your child's eligibility and to guide you through each step of the referral process. 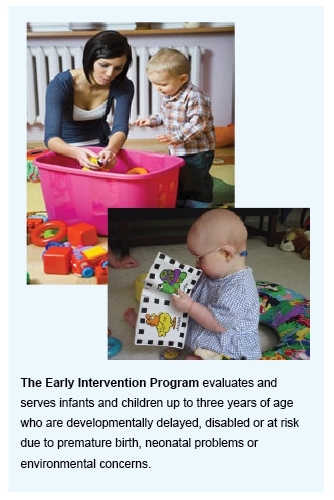 The Early Intervention Program (EIP) is a public program for children under the age of three who are either suspected of having or are at risk for developmental delays or disabilities. Potentially eligible children must be referred to the county program in Nassau (516)227-8661); (NYC dial 311) to receive EIP services. EIP is funded by New York State and county governments. Early Intervention services in your plan that are authorized by the County EI official are provided at no cost to parent. The County will arrange for the services to be provided based on the needs of your child and family. Your child’s health insurance may be used to cover some of the costs. All other costs for EIP services are paid for by your county and New York State. The EIP covers the cost of Early Intervention services only. The EIP does not pay for day care or other fees charged in community settings. A child's eligibility for the program can be determined only by state-approved evaluators under contract, and all services must be authorized by the county. The therapists at All About Development are experienced and NYS licensed because your concern is our concern! Copyright © All About Development - Early Internvention Program.